The Model 368R pneumatic vibration switch protects pnumatic equipment without the need for electrical power. The Robertshaw Model 368 PNEUMATIC The vibration switch is an effective method of avoiding costly damage due to mechanical malfunction of rotating and reciprocating machinery. In operation, the Model 368 actuates an audible warning system and/or shutdown circuit when vibration level of the protected equipment exceeds a threshold by a pre-selected amount. 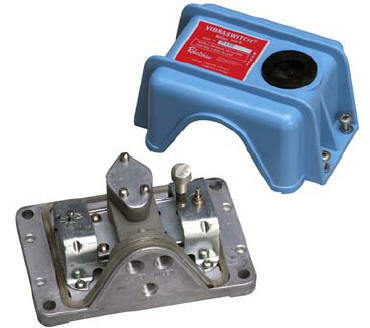 Vibration switches are widely used in permanent installations throughout the world; this versatile non-electric model requires only air or natural gas for operation. Being non-electric, Model 368 may be employed in hazardous locations without the usual necessity of an explosion proof housing. This feature also makes the instrument well suited for applications at pipeline compressor stations and on skid-mounted compressors, as well as countless other applications. The Model 368 is an acceleration sensitive instrument that measures the total acceleratory shock present on the machine. Acceleration is a vibration characteristic of prime importance in cases of mechanical failure on reciprocating or rotating machinery. Acceleration is directly related to the shock forces (impact) acting on a machine - thus the vibration switch offers a reliable measurement of the destructive forces acting on the machine. Choice of remote pneumatic or manual at unit. 368-R - Pneumatic Vibration Detector, Weather Resistant Housing. Range: 0-4.5 G. Pneumatic signal loss when setpoint is exceeded with manual and remote pneumatic reset provisions. 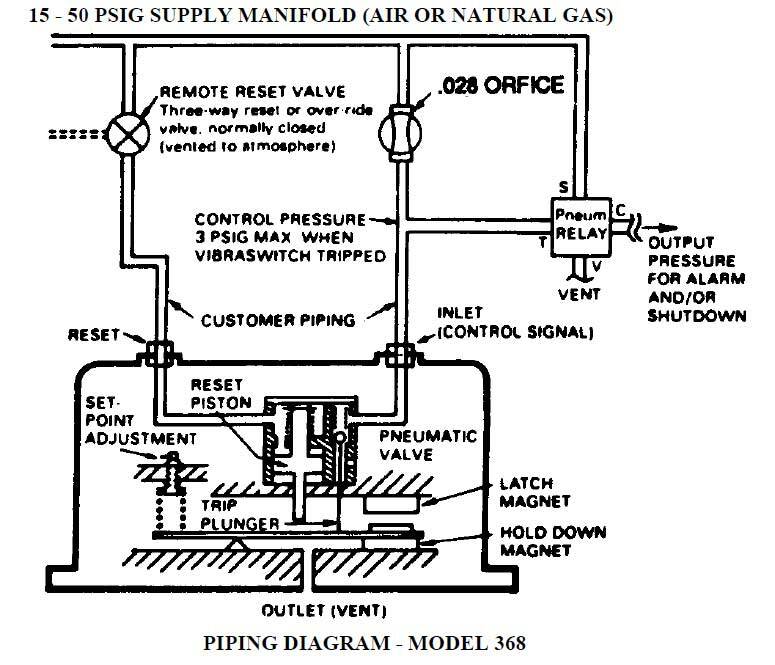 Reset supply pressure 15-50 psig. Accessory Items - (Must be ordered separately) * An Orifice must be connected to inlet of VIBRASWITCH for proper operation. 904GB014 - .028 Orifice. Double ended male fitting. Mates with SAE 45° flared female fitting for 1/4" hose. 99448-A1 - .028 Orifice. (1) 1/8 NPT male end and (1) 1/8 NPT female end. 83939-F211 - Reset valve, push-button. 1/8 NPT female connections.